EventLogChannelsView - enable/disable/clear event log channels. FullEventLogView is a simple tool for Windows 10/8/7/Vista that displays in a table the details of all events from the event logs of Windows, including the event description. It allows you to view the events of your local computer, events of a remote computer on your network, and events stored in .evtx files. It also allows you to export the events list to text/csv/tab-delimited/html/xml file from the GUI and from command-line. This utility works on any version of Windows, starting from Windows Vista and up to Windows 10. Both 32-bit and 64-bit systems are supported. 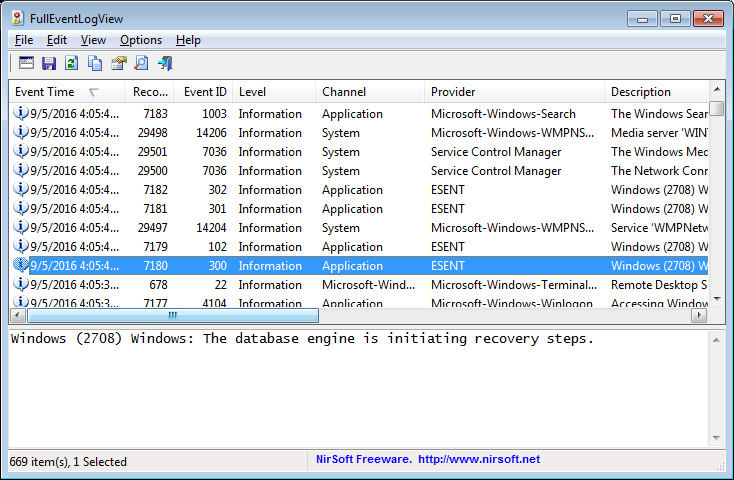 For Windows XP and older systems, you can use the MyEventViewer tool. MyEventViewer is a very old tool originally developed for Windows XP/2000/2003. Starting from Windows Vista, Microsoft created a new event log system with completely new programming interfaces. The old programming interface still works even on Windows 10, but it cannot access the new event logs added on Windows Vista and newer systems. MyEventViewer uses the old programming interface, so it cannot display many event logs added on Windows 10/8/7/Vista. FullEventLogView uses the new programming interface, so it displays all events. When choosing to load only specific event IDs (From 'Advanced Options' window), the loading process is much faster. Fixed bug: When connecting a remote computer the following error was displayed - Error 50: The request is not supported. Fixed the lower pane to use the right font size in high DPI mode. When exporting items with multiline description to tab-delimited file (Including the 'Copy Selected Items' option), FullEventLogView now put the description in quotes to ensure the exported data will be displayed properly in Excel and other programs. Added support for saving as JSON file. Added 'Show Event Strings In Columns' option (Under the Options menu). When it's turned on, 10 new event string columns are added to the main table ('String 1', 'String 2', 'String 3'...). These columns display the strings from the event decsription and you can click the column header in order to sort the events according to the event strings. Fixed bug: On some systems, FullEventLogView missed some of the events when using a time filter. Added option to filter according to strings of the event description (In 'Advanced Options' window). Added 'Quick Filter' feature (View -> Use Quick Filter or Ctrl+Q). When it's turned on, you can type a string in the text-box added under the toolbar and FullEventLogView will instantly filter the events table, showing only lines that contain the string you typed. Fixed the lower pane to switch focus when pressing tab key. Added option to specify time range in GMT ('Advanced Options' window). Fix bug: When using /SaveDirect command-line option, the file was always saved according to the default encoding, instead of using the selected encoding in Options -> Save File Encoding. Fixed bug: the process of exporting large amount of event log items from command-line was very slow, even when using /SaveDirect. Added option to automatically read archive log files (In 'Choose Data Source' window). This option works only when you run FullEventLogView as administrator. Fixed bug: FullEventLogView displayed error message when trying to read .etl files. FullEventLogView now displays an error message if it fails to load events from external evtx file or from remote computer. Added 'Choose Data Source' icon to the toolbar. If you want to load the events from remote computer on your network or from event log files (.evtx), you should use the 'Choose Data Source' window (F7). Show Event Description: Displays the full description of the event. Some event descriptions are too long for watching them in the 'Description' column, so you can view the long event description in the lower pane. Show Event Data + Description: Displays the full description of the event and additional data stored in this event. Show Event XML: Displays the full XML of the event. Smooth Refresh (F8): FullEventLogView only adds the new event items that have been created since the previous refresh. When Auto Refresh mode is turned on (Options -> Auto Refresh -> Every x seconds), FullEventLogView automatically executes a smooth refresh according to the refresh interval you choose, so you'll be able to see when a new event log item is created. By default, FullEventLogView doesn't request elevation (Run As Administrator). If you want to watch events thar are only available with administrator privilege (like the security log), you have to run FullEventLogView as administrator by press Ctrl+F11. FullEventLogView.exe /EventIDFilter 2 /EventIDFilterStr "8000,8001"
FullEventLogView.exe /ChannelFilter 2 /ChannelFilterStr "Microsoft-Windows-Dhcp-Client/Admin"
FullEventLogView.exe /DataSource 3 /LogFolder "c:\temp\logs" /LogFolderWildcard "*"
FullEventLogView.exe /DataSource 2 /ComputerName "192.168.0.70"
/stext <Filename> Save the event log items into a simple text file. /stab <Filename> Save the event log items into a tab-delimited text file. /scomma <Filename> Save the event log items into a comma-delimited text file (csv). /stabular <Filename> Save the event log items into a tabular text file. /shtml <Filename> Save the event log items into HTML file (Horizontal). /sverhtml <Filename> Save the event log items into HTML file (Vertical). /sxml <Filename> Save the event log items into XML file. /sjson <Filename> Save the event log items into JSON file. /SaveDirect Save the event log items in SaveDirect mode. For using with the other save command-line options ( /scomma, /stab, /sxml, and so on...) When you use the SaveDirect mode, the event log items are saved directly to the disk, without loading them into the memory first. Be aware that the sorting feature is not supported in SaveDirect mode. /sort <column> This command-line option can be used with other save options for sorting by the desired column. The <column> parameter can specify the column index (0 for the first column, 1 for the second column, and so on) or the name of the column, like "Record ID" and "Event ID". You can specify the '~' prefix character (e.g: "~Channel") if you want to sort in descending order. You can put multiple /sort in the command-line if you want to sort by multiple columns. A file named FullEventLogView_lng.ini will be created in the folder of FullEventLogView utility. After you finish the translation, Run FullEventLogView, and all translated strings will be loaded from the language file. If you want to run FullEventLogView without the translation, simply rename the language file, or move it to another folder. FullEventLogView is also available in other languages. In order to change the language of FullEventLogView, download the appropriate language zip file, extract the 'fulleventlogview_lng.ini', and put it in the same folder that you Installed FullEventLogView utility.